There are lots of ways to be remarkable -- to cause your clients to remark about you to others, and feed your business via word of mouth advertising. But apart from doing what you do remarkably well, you can deliver it remarkably well. 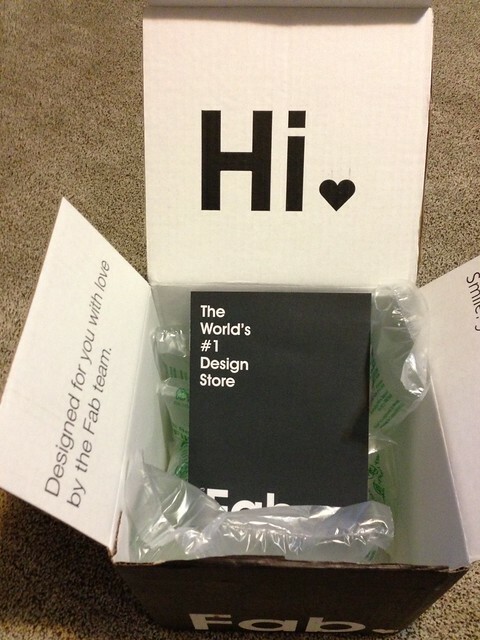 Case in point: this box from Fab. It contained a birthday gift from my wife. The gift itself (a waterproof shower notepad) is remarkable. But I was in a good mood even before using it, thanks to this box, with the surprising messages and mini-catalog included. So, it's a fine thing to do what you do remarkably well. I aim for that daily. I'm sure you do, too. But if you're not remarkable yet, or you're looking for an extra advantage, try delivering what you do remarkably well. Meanwhile, if you want to put an end to "feast or famine" syndrome in your business, my free Client Cloning Kit can help. Grab your free copy now, while they last. How Do I Close More Business? Here's a question from entrepreneurs and business owners that I hear all the time: How do I close more business? I hate the verb "close" in a selling context. It makes it seem like your job is over once the prospect gives you their credit card number or hands you a check. Nothing could be further from the truth, of course. As any sales pro will tell you, the real work begins only after the prospect says, "Yes." You're not closing a sale, you're opening a relationship (if you have any brains). So, let's rephrase the question: How do I earn more sales and open more relationships? I'm a big fan of sales scripts. By scripts, I mean proven responses to objections, like: "It costs too much," or "I want to think it over." Every multi-million dollar actor uses a script. So do multi-billion dollar credit card companies, banks, and other smart businesses whose employees have to sell by phone. What do they know that you don't? Why keep winging it when it comes to your livelihood? There's no good reason NOT to use a sales script, whether it's on the phone or in person. The good news is, if you’ve ever made a sale and can write down what you said, you have the basis for a life-changing sales script. It all starts when you "can and clone" that first collection of winning words. And I'll even give you the words to use as a basis for your first sales script. Ready? Just ask, "How were you hoping I could help you?" Whatever comes out of your prospect's mouth in answer to that question will tell you what they want. Your job becomes very simple at that point: Tell them how you will deliver. This is a great place to start any sales conversation -- and earn more sales. This is a stumbling block for loads of people. But it's easier than it seems. You simply have to find out the dollar value of the problem(s) you solve. Then, keep adding it up until the prospect feels compelled to buy. Here's an example. Let's say you sell software that boosts efficiency. On average, you save 15 minutes every working hour for the people who use your software. Those people earn $40,000 per year, or $20 an hour. If your software saves them 150 minutes a week, that adds up to 7,500 minutes (125 hours) saved a year, or $2,500 in annual savings ... $5,000 in two years. You can then tell prospects, "If, for an investment of $495 today, you save $5,000 in two years, you've just earned a return on investment of 910%. You're really buying money at a discount here. And I don't think even Warren Buffett can top those numbers." That changes the conversation, doesn't it? When you make it risk-free to buy from you, more people will buy. Guarantees have been used by mail-order companies for decades. Companies like L.L. Bean and J. Peterman are hugely successful today, but they were once small businesses. Their profits grew from a trickle into a mighty torrent because customers knew they could buy without the fear of being stuck with an item they didn’t like. Strong guarantees and quality products are an unbeatable combination. Yet, guarantees frighten many business owners. If you’re like most, it might only take five or six big refunds or major revisions in a year to spell financial trouble. What if your clients called their friends and all started asking for refunds at once? What if word got out around that your business was an easy target for crooked people who could rip you off? The way I see it, you already have a guarantee -- you just don’t know it. It's like this: If a client called to complain, what would you do? Offer to redo or replace the work, probably. Because it’s better to satisfy one angry client now than to combat a lot of bad word-of-mouth later. Especially when you consider that, thanks to social media, your clients all have audiences. And bad news travels fast. So, really, you need to satisfy your clients. And a guarantee makes it all possible. So there you go. Three ways to earn more sales -- and open more relationships. 71% of Your Customers Expect More Value. Now What? As a business owner or entrepreneur today, you face some tough challenges. According to “Small Businesses: Then & Now” by Constant Contact, 59% of small businesses surveyed say that it's harder to run a small business today than it was five years ago. Customer acquisition and retention are big problems -- of the small businesses surveyed, 75% cited "finding new customers" and 58% said "retaining customers" were primary concerns. According to Direct Marketing News, 63% of small businesses think their customers have higher expectations than 5 years ago. And among those small business owners, 71% think their customers expect more value. So. If 71% of your customers or clients expect more value, here's an idea: GIVE IT TO THEM. Bottom line: Yes, business is tough. You can whine about it, or do something about it. If you play the low-price game and lose to Wal-Mart and Amazon, without first making every effort to deliver more value to your customers or clients, you deserve to lose. Sorry. Meanwhile, if you want to put an end to "feast or famine" syndrome in your business -- and avoid cutting your prices -- my free Client Cloning Kit can help. Grab your free copy now, while they last. “Get good grades? Then you need to get into a better school so you can get a better job. Hit your sales target? They raise your sales target. Maybe once we retire rich, we can be happy. Thus, happiness remains elusive. “Our brains work the opposite way. A positive brain has a unique advantage over a negative or stressed one. Intelligence improves, sales rise 37 percent and productivity increases 31 percent. In fact, a happy brain improves every business and educational outcome, and many of our health outcomes like longevity and fatigue. Get that? You can double the impact a positive experience has on your brain and get happier. No drugs or technology needed. I’ve verified that a happy brain is a profitable brain -- and I paid $8,000 to do it. When I was a client in Dan Sullivan’s Strategic Coach program, participants like me gladly paid an $8,000 annual membership to fly to Toronto 4 times a year, sit in a room, and plan the next quarter of growth for our companies. And the first exercise we did at every meeting was what Dan called a Positive Focus. It worked like this: We wrote down 5 things that were going well in our business. Then we shared those “wins” with the other entrepreneurs at our table. By putting our brains in a positive mood, this set the stage for a productive day full of profitable insights. Every time. No matter what's going on in the world, you can control your attitude and make it nearly 100% positive, if you follow this advice. That little trick, frankly, is worth the $8,000 fee, plus airfare, hotel, and other costs, that I paid to learn it from Dan Sullivan. Here's the thing: You almost certainly were NOT depressed or down about life when you got your last valuable idea. You were probably relaxed -- even happy. You may have been driving, enjoying a walk, or taking a shower. In any case, the bottom line is this: A happy, positive mind is a profitable mind. An unhappy, negative mind is not. To jumpstart your mind and grow your business, spend just two minutes at the start of each day writing down 5 positive experiences from the last 24 hours. The results will positively shock you. Many of the most game-changing, profitable innovations in business involve doing more with less. A removal of something. Addition by subtraction. Examples: less time (Domino's Pizza), less hassle (Google), less money (Wal-Mart), less frustration (FedEx), etc. When you can remove unwanted things, and make life simpler and easier for people, they will reward you by becoming your customers. The classic example is anything from Apple vs. anything from Microsoft. Think of Apple Pages vs. Microsoft Word ... an iPod vs. a Zune ... a MacBook vs. a Windows laptop ... you get the idea. With an Apple product, you push the button and it works. With Microsoft, you must find the button, then push it, then download a driver, then scan for viruses, then ... wait, what was I doing? So, the next time you're tempted to "innovate" and create a new, whiz-bang product or service with all the bells and whistles, stop. Think less. It could be worth more to you. A lot more. Meanwhile, if you want to more clients like your best clients, my free Client Cloning Kit can help. Grab your free copy now, while they last. Here's the third and final in a series of postings to help you grow your business faster. When sales are down, the first instinct for many business owners is to lower their prices. You, too? The temptation is strong. Resist it. Better: Do the opposite -- raise your rates when sales are slow. 1. Raise your level of service along with your prices. What can you add to your current offerings, to justify a higher price? More time with you on the phone or in person? Expanded options? 2. Go after clients who can pay more. Got clients who are penny-pinchers? Dump them. People who can afford to pay more are also easier to work with, by and large. Bargain shoppers can nibble you to death with endless questions and complaints, in my experience (yours too?). In most cases, higher prices are more of a barrier in your mind than in the client's. But, as with all new ideas, test higher prices on a small scale before rolling out big. When you show your clients how much you appreciate them, they will return the favor with increased loyalty, repeat sales, and referrals, to name but 3 ways. In a world that craves appreciation, there's room in your industry for a new success story. All you need do is show clients how much you care. Then, find out exactly what they say when recommending your business to others. Yes, that means you pick up the phone, call them, and ask. Then what? Capture and clone their words. That means you write a short script based on what your top-referring clients are saying when they recommend your business to others. This is worth repeating: Write a referral script using the words your clients say about you -- NOT what you think they say or think they ought to say. Stick to reality. Do you like us? Please tell your friends! Here's what to say: "I found this bank where the loan officer actually knows my name and understands my business. And she gave me some great tips on marketing to help build my business, too. You should call Suzy Smith and tell her I sent you." If your clients are already referring you, find out what they're saying, and train the rest of your clients to say the same thing. That's all for this week. I hope you've found this 3-part series helpful in growing your business. Here's the second in a series of postings to help you grow your business faster. Today, I'll help you with part two: How to convert more prospects into paying clients. Look around. Most of your competitors' websites and advertisements probably offer Free Consultations, Free Information, and Price Quotes. You may be tempted to fall in line and do the same. Don't. Because, if you want be noticed by more people, you have to stand out. That means you have to be different in some way. Let all your competitors look like apples. You can be the only coconut in town. One of the easiest ways to do it is to use different words to describe what you do. Example: Instead of a Free Consultation, offer a Free Gap Analysis, a No-Cost Strategy Session, etc. Instead of Free Information, offer a Free Client Cloning Kit, a Free Savings Guide, etc. Instead of Price Quotes, send prospects Project Briefs, New Revenue Outlines, etc. Best part: You don't have to change what you do to change the game and be different. Just change the words. Few prospects will buy from you on the the first contact. They usually want to learn more about you, your industry, and their options before buying. That means you have to follow up with them. You can be a pest, like most of your competitors, who email or call to say, "I'm just following up ... just checking in ... just seeing if you had any questions." Bleh. Instead, do this: Be useful to prospects. I first learned this idea in 2009, in Dan Sullivan's Strategic Coach program. According to Sullivan, if you can bring confidence and clarity to people in your network, by researching their needs and then offering something useful -- product news, information about their customers, access to your contacts, expertise, etc. -- people will make time to talk to you. Because they will see you as an oasis in today's desert of awful economic news. As a result, people will take your calls, read your emails, meet you for coffee ... and be more likely to do business with you. By script, I mean proven responses to tough objections, like: "I can't afford it," or "I want to think about it." At this point, you may be rolling your eyes. "I don't want to sound like a telemarketer," you think. Or, "I have to be flexible with every caller," or "Scripts don't work anymore." Baloney. You're already using scripts -- right now. Anytime a prospect asks you, "How much does it cost?" or "What's your guarantee?" and you reply with an answer you've used before, that's a sales script. Why keep winging it? Why not plan and practice your words? There's no valid reason NOT to use a proven sales script, whether it's on the phone with a prospect or in person. The good news is, if you’ve ever made a sale and can write down what you said, you have the basis for a million-dollar book of scripts. It all starts when you "can and clone" that first collection of winning words. If you're worried about sounding stiff, here's a simple solution: practice your scripts, just like an actor. And I'll even give you the words to use as a basis for your first sales script: How were you hoping I could help you? Ask that question at the start of every sales call and watch your sales increase. Because it prompts prospects to cut to the chase and tell you what attracted them to your business in the first place. This is a great place to start any sales conversation -- and convert more prospects. Stay tuned for part 3 of this 3-part series tomorrow, when I’ll show you how to sell more to the clients you already have. Here's part one in a 3-part series of postings to help you grow your business faster. You may know that my next live event, on June 14 in Maple Grove, is aimed at helping entrepreneurs and small business owners work less and earn more. "What's the most challenging or stressful thing going on in your business right now?" Getting prospects to listen to something that could change their life for the better. Lack of clients and not knowing how to go after new ones. Long, slow sales cycle. Not being able to have a conversation with the decision maker. They want to email. Getting enough people to come in to try our product, then getting them to come back. Complex sale & long sales cycle combined with keeping enough work in the pipeline results in "roller-coaster" workload. How can we smooth it out? Thinking of new ways to advertise. Also I'm adding a few new services to my business. Trying to get new ideas for that too. Their words may be different, but their problems are the same: "I need more people to buy." Good news: Solving that one problem -- by getting a bunch of people to buy from you -- will solve just about every other problem you face in business. Today, I'll help you with that first part: How to attract more prospects. Not referrals -- referral partners. There's a BIG difference. You already know that referrals are the easiest people to sell to. The only problem? They tend to happen in small numbers, one at a time, days or weeks apart. Think of referrals as glasses of water. Referral partners, by contrast, are like wells that deliver streams of referrals to you on a regular basis. Example: If you're a blacksmith and you have a referral partnership with a horse farm, you could get all the referrals you need to stay busy for months. Anyone who sees your clients before you do is a potential referral partner. In my business as a direct-response copywriter, a single referral partnership has brought me nearly $31,000 in revenue in the past 9 months, by delivering a steady stream of referrals almost weekly. At my June 14 event, I"ll share this story with you -- and my friend Jim Bear will show you exactly how to set up your own referral partnerships. You've heard it said that, "Givers gain." It's true. We tend to buy from people we know, like, and trust. And one of the fastest ways to get known, liked, and trusted by people -- and turn them from strangers into buyers -- is to give. Give what, you ask? Try giving value. You can give value to prospects by giving your expertise, knowledge, and time to prospects. On top of that, you can give value through appreciation. Notice the things that people do that make a difference, no matter how small, and point them out. Then, say thank you, and mean it, by way of thank-you notes. Not emails, but handwritten notes, mailed with a stamp. Example: my copywriting practice is now self-referring and booked for weeks in advance. This is largely a result of my mailing thank-you notes nearly every day for the past three years. Of course, I’m pretty good at what I do, but given the choice to do business with a vendor who doesn’t show appreciation and one who does, who will get the business? In many cases, it’s me. That can be you, too. I call this concept "Thank-You Marketing" and I’ll share the whole thing with you on June 14. I'm a sneaky person. And I've secretly been visiting the websites of people who signed up for my seminar. Know what I found? A huge lack of testimonials on most of those web sites. How do you get great testimonials, without hiring somebody like me to interview your clients? Do these three things: listen, write, ask. 1. Listen for signs that your clients love what you do. "Mike, thanks for saying that. I really appreciate it. Would you be willing to let me use your comments, with your name and city, on my web site and other marketing materials? It would mean a lot to me. And it would tell others what to expect when doing business with me." "Mike, thanks again for agreeing to let me use your kind words about my business. Below is what I think I heard you say on the phone today. Would you please add to or subtract from it until it says exactly what you want it to say, then send it back to me? Thank you!" Stay tuned for part two of this 3-part series tomorrow, when I’ll show you how to convert more prospects into paying clients.